Sid Williams (1908 – 1991) was a bit of a Renaissance man – using his many creative talents and boundless energy to better his community and his province. Working alongside friends and colleagues, Sid and company were the movers and shakers for Comox Valley recreational and cultural groups. Sid went beyond our community borders to the rest of BC with his 1958 depiction of “Century Sam” to celebrate the province’s centennial year and at the historic townsite of Barkerville performing at the Theatre Royal for 16 seasons. Isabelle Stubbs, a life long friend, tried to sum up his accomplishments in an article she penned for the North Island Advertiser in 1972. 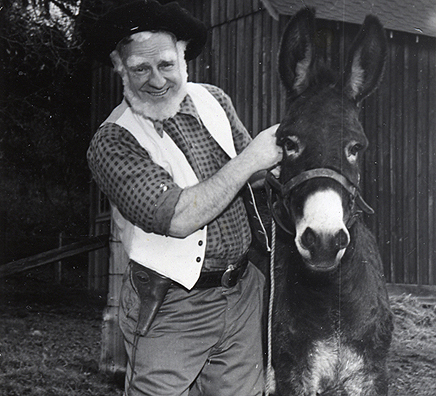 “…School trustee and alderman, prospector and mountaineer, voluntary fireman, business man, designer of stage sets, costumes and props; youth leader, inventor of imaginative oversize animals, winner of countless acting, directing, singing awards, artist in oils, comedian, master of ceremonies, Freeman of the City of Courtenay, Sid admits to representing Santa Claus more than 800 times in the Comox Valley…”. And that’s just up to 1972! Post-1972 Sid continued his involvement on stage and television. Continued to give back to this community that he loved being recognized for his accomplishments in 1984 when he became a Member of the Order of Canada. This temporary exhibit features costume and memorabilia created, collected by and related to the many aspects of Sid Williams’ life. We gratefully acknowledge the financial support of the Province of British Columbia through BC150, a Ministry of Tourism, Sport and the Arts initiative, and the assistance of the British Columbia Museums Association.